For a while now I've been intrigued by Jerusalem artichokes. I have seen them lying around, but never got around to buying them. Last week I decided that I no longer would want to be intimidated by these little roots, and decided to buy 2 pounds. And then, of course, I started wondering...how can I cook them to perfection. So I went on the internet and started snooping around for recipes. I learned that Jerusalem artichokes' (according to Wikipedia, also called sunroot, sunchoke, earth apple or topinambur) best friends are thyme and smoke. 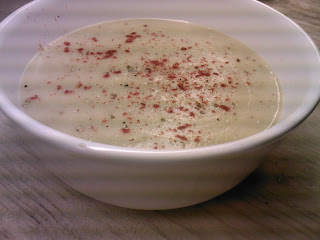 I decided to transfer my artichokes into a creamy soup. So this recipe is the result of my first experiment with these tubers. It has a soft flavor, which is hard to describe. I loved it, the boyfriend was not so much in love (but he doesn't like tofu either, so who are you going to believe?). So if you can get a hold of these tubers, you might want to give this soup a chance. Peel the artichokes and potatoes and cut them into small pieces. Mince the garlic and shallots. Heat a tablespoon of oil in a pan and fry the onion and garlic on medium hight. Add the thyme, potato and Jerusalem artichoke cubes. Fry for a minute and add the water and stock cube. Let it simmer on low heat until the vegetables are soft and mushy. Finally, add the cream and let it simmer for another two minutes (this is quite a thick soup. If you prefer a thinner soup, just add some water or cream). Puree the soup until smooth. Transfer to a bowl or deep plate and sprinkle some pepper and smoked paprika on top. 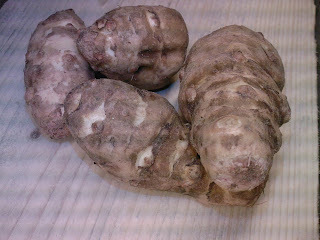 I LOVE Jerusalem artichokes! I'll be sure to give this a try. Thanks for sharing.